Korrie Taylor (right), director of Baldwinsville Theatre Guild’s Sweeney Todd, offers her thanks during the 2016 SALT Awards show. 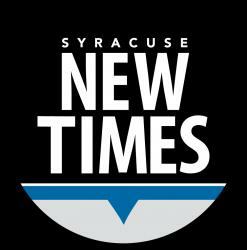 The nominations have been tallied for the 14th annual Syracuse New Times Syracuse Area Live Theater (SALT) Awards, which honor performances and behind-the-scenes work by area professional, regional and community theater companies. The SALT winners will be announced during a ceremony to be held Sunday, Nov. 11, 6:30 p.m., at the Redhouse Arts Center, 400 S. Salina St. The show’s presenting sponsor is Empower Federal Credit Union. This year’s co-hosts will be WSYR-Channel 9’s Bridge Street personality TeNesha Murphy and actress (and former Rockette) Bradley Benjamin. Cocktails and light fare will be available. Discounted pre-sale tickets are available for $22 until Saturday, Nov. 10, midnight. Tickets at the door will be $25. Visit CNY Tix to purchase tickets. And follow the SALTs on Facebook, Instagram and Twitter for regular event updates: @SALTS2018.